Overview - Will Turner (Orlando Bloom), Elizabeth Swann (Keira Knightley) are allied with Captain Barbossa (Geoffrey Rush) in a desperate quest to free Captain Jack Sparrow (Johnny Depp) from his mind-bending trap in Davy Jones' locker, while the terrifying ghost ship, The Flying Dutchman and Davy Jones, under the control of the East India Trading Company, wreaks havoc across the Seven Seas. Navigating through treachery, betrayal and wild waters, they must forge their way to exotic Singapore and confront the cunning Chinese Pirate Sao Feng (Chow Yun-Fat). Now headed beyond the very ends of the earth, each must ultimately choose a side in a final, titanic battle, as not only their lives and fortunes, but the entire future of the freedom-loving Pirate way, hangs in the balance. 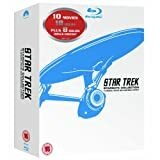 On December 4th, 2007 we added a note to the video section of this review addressing a packaging error on some editions of this Blu-ray disc. After the freshness and sheer exuberance of 'Curse of the Black Pearl,' there was no place for a sequel to go but down, which is exactly where 'Dead Man's Chest' went. Noisy and chaotic, it was overstuffed with unnecessary subplots to the point of being virtually incomprehensible, failing to even resolve itself with any satisfaction, trading a clear-cut resolution for a lame cliffhanger ending right out of a Z-grade '40s serial. Such a weak second chapter didn't exactly inspire confidence in a third, so by the time 'Pirates of the Caribbean: At World's End' rolled into theaters last summer, I didn't even bother to buy a ticket. Now that I've had a chance to see the film on Blu-ray, I can say that while 'At World's End' doesn't come anywhere near matching the good-natured charm of 'Black Pearl,' it's a great improvement over 'Dead Man's Chest,' and it finally steers the storyline back on track. It's truly a relief that the filmmakers resisted the urge to torque up the action even further, and instead refocused their energies on the core characters we loved in the first movie. What's best about 'At World's End' is that it finally puts Depp back in his place as Captain Jack Sparrow. Although only a supporting character in 'Black Pearl,' he proved such a hit with audiences that he was promoted to star of 'Dead Man's Chest.' But like a 'Star Wars' movie starring C-3P0 but without Luke Skywalker, the comedic foil doesn't work without the straight man to play off of, and the supposed leads of 'Black Pearl' (Orlando Bloom's Will Turner and Keira Knightley's Elizabeth Swann) were so pushed into the background in 'Dead Man's Chest' that the film had absolutely zero emotional weight. By contrast, 'At World's End' doesn't even bother to introduce Sparrow for over a half an hour, and it's a brave choice that pays great narrative dividends. The spotlight is now back on the core romance between Will and Elizabeth, so once again we have a story that is at least one of consequence (even if it is a bit of a remake of the first film). All of this is not to say that 'At World's End' doesn't suffer from plenty of creative cannibalism. Screenwriters Ted Elliott and Terry Rossio left so many loose ends dangling in 'Dead Man's Chest' that the first half of 'At World's End' feels like an extended ending -- only when Jack Sparrow is rescued from purgatory can the characters and plot finally move forward, and boy, does take a while to get there. Also repetitive and tiresome is returning director Gore Verbinksi's staging of familiar action motifs from past installments -- just how many sword fights in various locations can we see in one movie series, anyway? To be fair, the film's extended "maelstrom" battle between multiple pirate ships around a swirling vortex is utterly fantastic, but it only reminds us that the rest of the film doesn't possess nearly the same level of inventiveness. Typical of the later chapters of many movie trilogies, both 'Dead Man's Chest' and 'At World's End' have trouble distinguishing between pastiche and plagiarism, and much just feels too familiar. Depp has stated recently that he's open to the idea of the continuing the adventures of Captain Jack in future films, and given the profits generated by the first three installments, it's hard not to imagine that Disney wouldn't love to mine the 'Pirates' franchise for even more gold. But I sure hope they don't. 'At World's End' is a perfectly fine, if flawed, capper to a franchise that has (in my opinion) pretty much worn out its welcome. After three films and nearly nine hours worth of buccaneers and buried booty, the only time I ever want to see Johnny Depp dressed up as Captain Jack Sparrow again is on the actual 'Pirates of the Caribbean' ride at Disneyland. 'Pirates of the Caribbean: At World's End' on Blu-ray has a lot to live up to. It follows both 'Curse of the Black Pearl' and 'Dead's Man Chest,' which I found to be two truly demo-worthy transfers that easily rank among the best-looking discs I've ever seen on the format. Although Disney does not mar that legacy with 'At World's End,' it's not quite as perfect a high-def presentation as the first two films, and for some may even rank as a minor disappointment. Disney again offers a 1080p/AVC MPEG-4 encode for 'At World's End.' As the film was shot concurrently with 'Dead Man's Chest,' both transfers have an identical visual look. The source is pristine, with no blemishes or defects. There is some film grain present, but it's hardly intrusive. Colors are very well rendered, with 'At World's End' again awash in deep midnight blues and intense uses of orange (it's rare that there's a scene in a 'Pirates of the Caribbean' movie without a flickering torch). Some scenes do have an intentional blue or green cast, but fleshtones are as accurate as can be expected. As with 'Curse of the Black Pearl' and 'Dead Man's Chest,' shadow delineation on 'At World's End' is extraordinary. It truly is the most impressive technical aspect of these transfers for me, with even the darkest areas of the image always revealing some sort of neat little detail. Depth and detail remain extraordinary as well, with every pore and cragged tooth of the actors apparent (sometimes painfully). The presentation also remains fantastically sharp - I don't think a single shot in 'At World's End' displays a hint of softness. Unfortunately, I don't feel I can give 'At World's End' the same five-star video rating I gave 'Curse of the Black Pearl' and 'Dead Man's Chest,' because I found a few inconsistencies a bit too hard to ignore. Noise is the biggest problem -- I noticed it at times on fleshtones, as well as areas of static color. Even more troublesome, it can be glaringly obvious on areas of bright white, such as the entire surreal sequence with Depp playing multiple versions of Captain Jack Sparrow. Blacks also waver, with a few scenes looking quite flat and lacking in depth. Although these are not fatal problems considering the beauty of the rest of the presentation, 'At World's End' left me only very satisfied, and not blown away as I was with the first two 'Pirates' flicks on Blu-ray. Absolutely smashing. 'At World's End' easily matches 'Curse of the Black Pearl' and 'Dead Man's Chest' in the audio department. Disney has served up another uncompressed PCM 5.1 Surround track (48kHz/24-bit) that's totally gangbusters, with enough demo-worthy scenes to fill up ten other discs. Exactly as you'd want and expect from a 'Pirates of the Caribbean' film, 'At World's End' is totally bombastic. Though not a film of wall-to-wall action like 'Dead Man's Chest,' 'At World's End' has enough outstanding sequences of its own that it's just as much of a sonic thrill. The climactic "maelstrom" battle is the absolute highlight, with the "wall of sound" effect so well executed it's hard to imagine anything better. The finesse of pans between channels and the pinpoint-accurate placement of discrete effects is absolutely first-rate, to the point where the illusion is never less than utterly transparent. Dynamics are also outstanding. The force and tightness of low bass delivers a wallop to the subwoofer, and the rich smoothness of the high-end is wonderfully rich and vivid. Hans Zimmer's score has a more Eastern influence this time around, with a nice mix of organic and synthesized instruments, and it is rendered perfectly here, with a nice and even tone and aggressively bleed to the back channels. And as was the case with the previous two 'Pirates' Blu-rays, dialogue and subtle sonic details are never overwhelmed in the mix, and volume matching is never an issue. Disney has truly knocked it out of the park again with the sound on 'At World's End,' delivering a third 'Pirates' demo disc to add to your collection. Bloopers of the Caribbean (HD, 5 minutes) - Your typical assortment of on-set gaffes, dropped props and messed-up lines, for once it's all actually quite amusing -- especially when it comes to Johnny Depp, who seems to be having more fun off-screen than on. Here's where the good stuff can be found. Containing about 90 minutes worth of material, disc two is essentially one long documentary broken up into a bunch of little pieces. But more than just an EPK-style hard-sell padded out with film clips, the vast majority of the runtime is devoted to genuine behind-the-scenes footage and interviews with every major cast & crew member, including director Gore Verbinski, producer Jerry Bruckheimer, and stars Johnny Depp, Keira Knightley, Orlando Bloom, Chow-Yun Fat, Geoffrey Rush and Bill Nighy. Featurette: "Anatomy of a Scene: The Maelstrom" (HD, 20 minutes) - Setting the tone for all of the featurettes on the disc, this one dissects the film's stunning centerpiece in technical (but not too dry) detail. There is also considerable ground-up effects footage illustrating how many of the shots were created almost completely in the digital realm. Featurette: "The Tale Of The Many Jack" (HD, 5 minutes) - The "Inside Davey Jones' Locker" sequence was easily the film's most surreal moment, featuring multiple versions of Depp playing the entire crew of a pirate ship. Here, we learn that rather than have the actor play every single performance (which probably would have taken weeks), an ingenious blend of CGI, camera tricks and editing was used to achieve the final effect. Featurette: "The World of Chow Yun Fat" (HD, 5 minutes) - A nice, if fawning, portrait of the Hong Kong actor, featuring comments from Bloom, Bruckheimer and Rush. It's nice to see Fat get some much-deserved recognition, but this peice is far too short to make much of an impact. Featurette: "Keith & the Captain: On Set With Johnny And The Rock Legend" (HD, 5 minutes) - Following months and of months of "will he or won't he?" 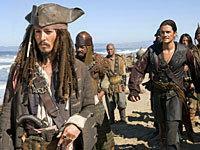 rumors, Keith Richards does indeed appear in 'At World's End' as the father to Captain Jack Sparrow. It's a great nod to Depp, who cited the famous rocker as one of his main inspirations for his original, Oscar-nominated performance in 'Curse of the Black Pearl.' Needless to say, Richards' appearance here lives up entirely to his reputation. Featurette: "Hoist the Colors" (HD, 5 minutes) - An addendum to the above featurette, Zimmer returns to specifically discuss the film's haunting opening song. Deleted Scenes (HD, 3 minutes) - There are only two scenes here, barely running a combined 3 minutes: "I Like Riddles" and "Two Captains, One Ship." Neither would have added much at all to an already bloated film. Verbinski drops in to offer optional audio commentary on both scenes.